Some of our most frequently asked questions are answered below. If you cannot find an answer to your questions, please feel free to call us at (800) 804-7555. What is an nYOU Visa Check Card? An nYOU Visa Check Card is just like a normal debit card, except you get to choose the photo or image that appears on the card. There are image guidelines to follow but as long as your image complies with the Image Guidelines, you can create a debit card that is unique to you. How do I create my nYOU Custom Visa Check Card? If you already have a NorStateFCU Visa Check Card, please visit our nYOU Card Design Center to customize your new nYOU Visa Check Card. Card customization is easy; there are three simple instructions to follow. Upload the photo you would like on your card. Customize the look of your card by enlarging, cropping, or rotating. What if I don't have a NorStateFCU VISA Check Card? If you have a checking account, but not a NorStateFCU VISA Check Card, please contact us to open one. If you do not have a checking account with us, we ask that you kindly stop by one of our 6 locations and open an account or apply online. The process is quick and easy, plus you can use our Switch Kit to make changing institutions painless. What type of account do I need for CUPayLink and how do I enroll? A NorstateFCU Share Draft Account (checking) and our free Online Banking service. Once you have logged into your Online Banking account, you would need to click the link above that states "CUPayLink" in order to enroll. When enrolling, please make sure to enter your full MICR Number located on the bottom of your check book starting with "70036". What is the fee for CUPayLink? 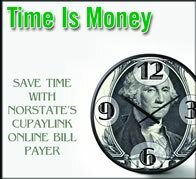 There is no charge for using NorState Federal Credit Union's CUPayLink, which means you can pay an unlimited amount of bills. There is however, an inactivity fee of $5 per month after 3 months of inactivity. Is CUPayLink Bill Pay Secure? CUPayLink uses 128-bit encrytion and front-end safeguards to secure your online transactions, utilizing a high-security 24/7 monitoring system. Are CUPayLink payments guaranteed to arrive on time? Yes, payments are usually guaranteed to arrive based on the estimated arrival dates given to you after scheduling your payment. The dates are just estimates and may take longer depending on the merchant, so always try to schedule in advance to ensure on time arrival. You can view up to one full year of payment history. Who can I contact for help with my CUPayLink Account? If you are experiencing problems with your CUPayLink account, please contact IPay at (866) 884-5331. If you still require additional assistance, please call us at (800) 804-7555. You can also open a chat session with an IPay representative if you are unable to call. When I click the CUPayLink, it says contact your Credit Union and nothing happens? If you experience this problem, please make sure all pop-up blockers are disabled on your computer, because popup blockers will prevent the site from loading. a. How do I Register for Online Banking? Enrollment is easy, visit https://www.norstatefcu.org/home.asp; click "Register" at the top, on the right hand side of the screen) to begin the enrollment process. Enter the primary member’s account number, last four digits of the social security number and date of birth and type “Yes” to accept the agreement and then click start to continue. Please make sure to read the Online Banking Disclosure. NorStateFCU Online Banking allows its members to manage their accounts from the comfort of their home; it’s free, secure and accessible 24/7. Once your account has been correctly identified, you will need to setup your Username and Password. Then select 3 Security questions and type in your Answers. Final step, type a Security Phrase and select an Image to go along with your Phrase. That’s it. b. Logging Into Online Banking? To access NorStateFCU Online Banking, please visit our home page at https://www.norstatefcu.org/home.asp and enter your Username to login. You will then need to verify your security phrase and security picture to continue. Once you have verified the phrase and the picture, you have assured yourself you are logging into NorStateFCU Secure Online Banking site; at this point, you may type your password to login. c. I already have a Username, how do I register? To register, please visit https://www.norstatefcu.org/home.asp and enter your Username and existing Password to get started. You will then be prompted to setup new Security Questions, a Security Phrase and Security Picture for your account. a. What can I find on the Account Summary Page? b. I have too many accounts listed, can I customize my view? Yes, if you have many accounts, you may want to mark some accounts as favorites first by clicking the start icon next to each account and click Yes and save to designate that account as a favorite. Once you have completed this for all accounts, click Options below Account Summary, and then click Show Only Favorite Accounts from that list. Note that the totals still reflect all of your accounts. c. Is there a quick and easy way to find transactions? Yes there is, if you know the dollar amount, you can type it in the search field above and click search for the system to locate the transaction. a. How do I change my Username and Password? To change your Online Banking Username and Password. Login to your Online Banking Account; click on Profile – in the upper right hand corner of the page, scroll down to Sign In Info and click More Details. At this point, you can click edit next to your Username and Password to update those fields. When making changes, make sure to click Show Rules, so you can see the requirements for Username and Passwords. b. How can I update my Personal Information? To update your personal information, login to your Online Banking Account; click on Profile – in the upper right hand corner of the page, scroll down to Sign In Info and click More Details. At this point, you can click edit next to your Username and Password to update those fields. When making changes, make sure to click show rules, so you can see the requirements for Username and Passwords. c. Can I extend my Online Banking Session? Yes, you can extend your online banking session by logging into your account, click on Profile – in the upper right hand corner of the page, scroll down to Sign In Info and click More Details. At this point, you can click edit next to Timeout to extend your session time. The default time is set to 10 minutes, but can be extended up to 30 minutes in increments of 5 minutes. a. Why do I need to answer Security Questions? Due to new Guidelines set forth by The National Credit Union Administration (NCUA), all Credit Unions must implement added security measures to protect member’s accounts from unauthorized access. Usernames and passwords may not be enough to fully protect your account. Securing our members' accounts is our upmost priority, that’s why we implemented Multi Factor Authentication (MFA). This security measure provides multiple ways of verifying a member’s identity to ensure you are the one accessing your account. This will help mitigate the risk associated with Identity Theft and Online Fraud. Security questions are one of those layers of protection. The questions and answers are established during online registration, they are stored on your profile to verify your identity upon future logins. b. How often will I get asked to answer Security Questions? Security questions are asked when logging into Online Banking from an unknown computer or a computer that has not been remembered by the system. To prevent the system from asking every time, there’s an option that states “remember my computer”, so you are not prompted every time with a question. If you delete your browser cookies, you will be prompted to answer another security question. c. What happens if I forget my Security Questions? If you forgot your security questions, please call us at (800) 804-7555, we will need to Re-Register your account, which will allow you to establish a new password and establish new questions and answers for your account. d. Are Security Questions case sensitive? Yes, security questions are case sensitive. You must type in your answers the exact same way you created them or else the system will not confirm your identity. e. I’m locked out of Online Banking, what should I do? As a security measure, a member’s account will be locked out after 3 invalid attempts at answering passwords or security questions. Should this occur, please call us at (800) 804-7555 to have your account unlocked. This is to protect your account from unauthorized access. f. Can I change my Security Questions? Yes, you can change your security questions by logging into Online Banking, click on Profile, under Sign In Info, click on More Details. Scroll down under Additional Signin Info; click Edit next to each question to make changes. g. What’s a Security Phrase and what is it used for? As an added security measure, you were asked to provide a Security Phrase and Security Picture during registration. The Phrase and Picture are used to confirm a few things before typing in your password. First, it confirms that you typed the correct username; secondly it assures you are on a genuine NorStateFCU website and lastly it indicates that the account has been registered. If you don’t recognize the Phrase and Picture, one of the above mentioned reasons might be the case. If you are certain that it is not the Phrase and Picture you provided, please call us at (800) 804-7555.
a. Can I view Accounts from Other Institutions? Yes, you can view current account history from participating institutions, but cannot view balances. To add another institution, click Options on the Account Summary page and click Add Accounts from another Institution to get started. b. Can I transfer funds from another institution using Online Banking? No you cannot transfer funds from another institution to your NFCU Account Online. If you would like to transfer funds, please give us a call and we can process a wire transfer for you, a fee applies. If the institution is part of the Shared Branching network, you can transfer funds from one account to another by visiting any of our 6 locations. c. Does Online Banking Support Quicken or QuickBooks? No, online banking does not support Quicken or QuickBooks at this time. It supports .CSV format only. This format can be downloaded from any account and opened in Excel. It will include a history of transactions on that account. d. What’s a Home Page? A Home Page allows members to customize their default screen or landing page upon logging in. At times you may prefer to go directly to your Statement’s page instead of your Account Summary page. Simply go to the page you would like to set as your Home Page, click the Set Home Page option at the top of the page, this completes the process. e. Why didn't my transfers go through? In order for your transfer to go through correctly, you must click Confirm Transfer to complete the transfer on the second screen or else the transfer will not be processed. f. Why can’t I find my statements? Statements can be found by clicking the Statements Tab above, locate the statement you would like to print. At this point you will be given the option to Download the statement to open it or save it to your PC. g. How many months of history can I receive online through Online Banking? You can receive 2 months of transactions. The current month and the previous month. h. What transactions can I do through Online Banking? Almost everything that can be done in person at NorStateFCU. You can make withdrawals, transfer funds between accounts, view recent histories or make loan payments, place stop payments on checks and so much more. Rather than receiving your statements in the mail, you can receive it online. You can view statements as far back as 2 years. You can apply online or at your nearest NorState Federal Credit Union Office. This service is free of charge and is accessible 24/7/365. How many months of statements can I retrieve? You can retrieve up to 18 months of statements. Why am I having troubles accessing my CU e-statements? In order to access your CU e-statements, please make sure all pop-up blockers are disabled on your computer and you have Adobe PDF reader installed. Shared Branching allows credit unions from all over the country to share facilities to give members thousands of convenient locations to perform transactions just as if they were at their home credit union. Whether you are at work, home, or your favorite travel destination, your credit union is always nearby. What kind of transactions can I conduct at a Shared Branching location? What is required to take advantage of this service? Can I get history on my Visa through Online Banking? No. Histories can only be accessed through www.ezcardinfo.com . You may however check your credit card balances. Why does my credit card payment not change right away? It takes two days before your Visa payment is posted so you will not see a change before two days.